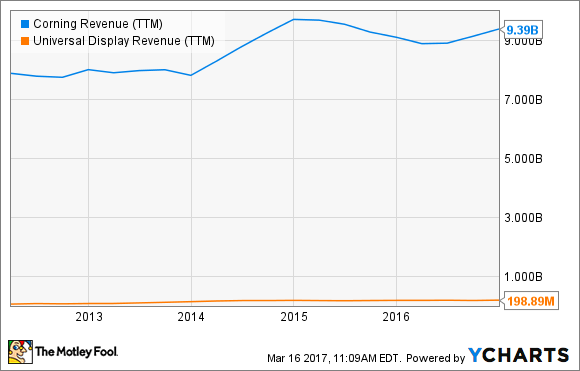 Better Buy: Corning Inc. vs. Universal Display Corp. Which one of these screen-building technologists is the better fit for your investment portfolio? Corning (NYSE:GLW) and Universal Display (NASDAQ:OLED) have a lot in common. In fact, they are more often partners than competitors. So if you want to invest in the global market for smartphone, tablet, and television screens without taking a side in the consumer-level brand wars, which one should you choose? Being much larger and sporting a longer operating history, Corning enjoys some obvious advantages over Universal Display. The company is not joined at the hip to any particular end market, which provides operating stability when a handful of target markets are sailing through rough waters. Corning's largest end markets include TV and phone screens, ceramic substrates for diesel engines, polymers used in the biotech industry, and fiber-optic materials. The company's largest business segment accounted for just 32% of total sales in 2016, and even then, the display technologies revenue stream was divided into many different clients and store-shelf markets. Three words: economies of scale. In spite of running capital-intensive manufacturing operations, Corning crushes Universal Display's returns on equity and bottom-line profit margin. Short-sellers are wary of betting against this proven long-term performer, while nearly 13% of Universal Display's shares have been tendered into negative plays. These are the upsides of Corning carrying nearly 50 times the annual sales of the smaller company. GLW Revenue (TTM) data by YCharts. On the other hand, many investors actually seek out smaller and nimbler businesses due to their larger growth opportunities. That's what Universal Display offers here, and it's why I own the OLED specialist but not the glassware manufacturer. OLED screens have been around for decades now, but have only recently started breaking into mainstream markets. Moreover, the smartphone and tablet screens where you typically find Universal Display's technologies today tend to be small -- and the company's top and bottom lines are largely based on the total area that's being covered in OLED materials. The next rocket boosters under Universal Display shares should look a lot like lighting panels and big-screen TV sets. A 55-inch TV screen needs roughly 100 times the amount of OLED materials needed to build a 5.5-inch smartphone screen. If and when OLED TV sales reach mainstream volumes, the unit sales that hit Universal Display's income statement will be greatly magnified. This is happening as we speak. A 55-inch OLED TV set used to retail for $5,000 just two years ago. Now you can find a 55-inch 4K TV with OLED technology for less than $2,000. It is still expensive next to a $1,000 LCD screen of the same size and resolution, but OLED prices keep falling as manufacturing gets cheaper and more efficient. The race for consumer hearts and minds is about to turn very competitive. And for Universal Display investors, that'll be a hockey-stick move to remember. As a growth investor at heart, I own Universal Display because I want to exploit the massive untapped markets that lie ahead for OLED technologies. The company is investing heavily into next-generation OLED research, and has never been afraid to acquire patent portfolios from other companies as the opportunities arise. It's a growth story for the long haul, and I'm all in. That doesn't mean Corning is a poor investment. With a diverse and stable business platform, this company also taps into many of the same growth stories that make Universal Display so exciting to own. This stock just doesn't fit my personal investing style, but your mileage may vary. There's a place for dividends and stability, and Corning offers these qualities in spades.